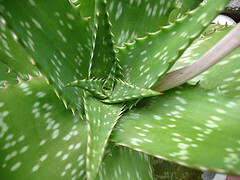 It is recommended to keep an aloes vera plant at home. For burns or other skin damage, cut off part of a leaf, slice it down the middle exposing the gel substance inside. Apply this to the burn or to have younger looking skin. Split the leaf in half as above and extract the gel. Sweeten with sugar and refrigerate. Refrigerate letting it settle at least 2 hours. 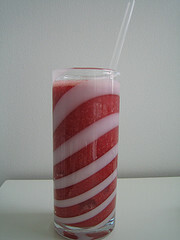 Variations: aloe vera with ice tea; with orange juice, with pomegranate juice. Aloe vera has been recommended for detoxification of the liver, to reduce the stress on it by the removal of waste which in turn is thought to alleviate outbreaks of psoriasis and eczema in many cases and helps to produce younger skin. A doctor should be consulted if one plans to drink a lot on a steady basis as it can have adverse effects for a few.